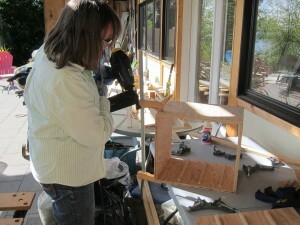 There are a number of factors I took into consideration in setting up my workshop for Asian lacquer. 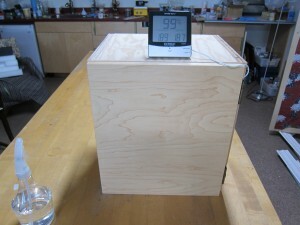 Isolation, ventilation, and control of the relative humidity being the ones I was most concerned about. 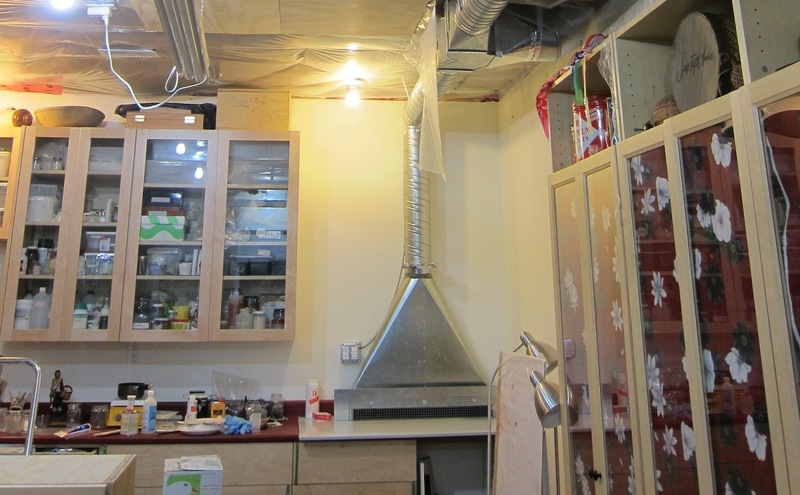 Isolation may seem a bit odd but there are two factors within this category the first being control of dust and the second control of access to the Asian lacquer work area. Dust is a real nuisance when working with Asian lacquer. Because it dries slowly it is easy for dust to land on the surface and be fixed to it thus marring the finish. I’ll write more about dust control when I get to the finishing layers. Isolating your work area and controlling access to it is also a good idea because of the toxicity of the material. Asian lacquer, from the Anacard family of plants, in its liquid state is well known for its health hazards. The main component of lacquer, urushiol, laccol or thitsi can cause a severe skin reaction in many people if it comes in contact with skin and is not washed off immediately. The effects of urushiol have been studied but it is reported that laccol and thitsi also cause a reaction to a lesser degree. The urushiol chemically reacts with proteins in the skin, which is followed by an immune response in many individuals causing a rash with blisters. The severity of the reaction depends on the individual. While some people seem to have a natural immunity and others can build up immunity, a few people will become increasingly sensitive to the urushiol over time. Severe allergic reactions are not unknown. For individuals uncertain of their reaction, extra precautions are advised when working with lacquer. First the Asian lacquer work area should be kept separate from the rest of the workshop. It is easy for visitors to be unintentionally exposed. Although I cannot have a separate room for lacquer work I have a designated area for lacquer work and warning signs posted. It is recommended that disposable latex, vinyl or nitrile gloves be worn. I use Ivy Block on any exposed areas of skin such as my forearms and face. It is amazing how many times we unintentionally touch our faces during the day. Ivy block was developed by the US forestry service. It was designed to react with the urushiol thus neutralizing it and preventing it from coming in contact with the skin. Although I used to get rashes when I first worked with urushi, I have not had a reaction for years. I do not know if this is a result of being careful to avoid exposure, using Ivy block or just developing a natural immunity. One final note on this subject is to clarify the mistaken idea that lacquer is still toxic after drying. This is not so. Once polymerized it is no longer toxic. Even when lacquer breaks down with exposure to light, the degradation products are not toxic. Although one can work with urushi without ventilation solvents are required for clean up. I prefer to work with a ventilated bench top and have my furo for drying the lacquer within a short distance. It keeps the lacquer in one area and minimizes dust exposure. My ventilation system is based on the bench top models developed at the Canadian Conservation Institute. I had a local sheet metal company (Pike Sheet Metal) in Gibsons, BC, build the bench top capture device and a ventilation contractor install the system. The variable speed blower is located outside the house to minimize noise. 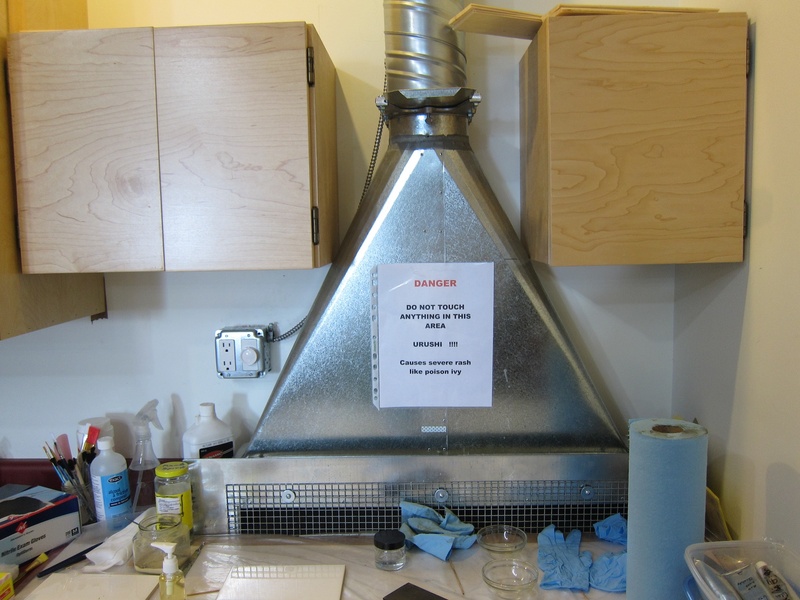 This system was very inexpensive and allows you to work without having to bury your head in a fume hood. Efficient ventilation is provided in an area about 40 inches wide and 15 inches high with a depth of 20 inches from front to back of the work area. This is space is perfect for me to make sample boards whether they are European or Asian lacquer. The main purpose of a drying cabinet is to provide a humid, dust-free atmosphere that promotes the hardening of the lacquer. Asian lacquer is best dried between 70 and 85% relative humidity. A suitable balance must be achieved between temperature and humidity. If the humidity is too high the lacquer might dry too quickly on the surface and not underneath. Evidence of this would be seen in a wrinkled surface. 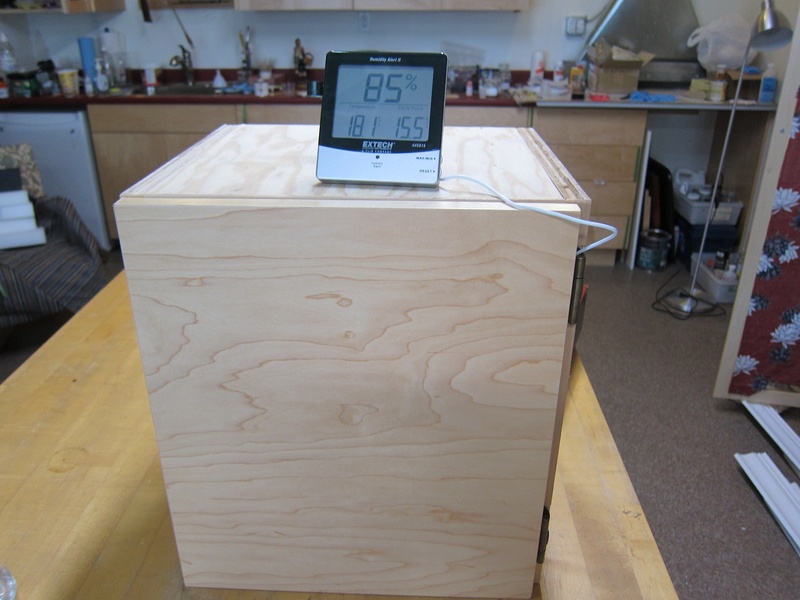 While slow drying is desirable to achieve a glossy surface, there should be enough humidity to provide for complete polymerization of the lacquer. At least 50% is required for drying. Another problem, which can be encountered during hardening, is that of condensation. Should the temperature drop during drying, condensation in the form of small water droplets on the wet lacquer will ruin the surface. The small pale marks resulting cannot be wiped off but instead must be ground away and the whole surface lacquered again. With so many factors to consider it may be surprising to find that most drying cabinets are simply unvarnished wood. The interior of the cabinet is sprayed with water daily. The wood absorbs the water and slowly releases it. The cabinets that I made for this project are constructed of five-layer douglas fir plywood joined using a nail gun and finishing nails. I bought the plywood but just about everything else I had in the workshop already. Rails to hold the shelves were made from 1 cm, quarter round. For the shelves I used left over tongue and groove boards 8cm x 5mm thick. The boards are used individually with gaps between to allow air to circulate and they are not attached so they can be reconfigured to accommodate different sized objects. For the front doors I reused two that had been discarded, because as they were the wrong size for another set of cabinets. This had the added benefit of matching the other lab cabinets. Purely for esthetic reasons I applied maple veneer to the visible surface of the exterior plywood. After the cabinets were constructed I conducted tests of the interior relative humidity levels after spraying with distilled water. 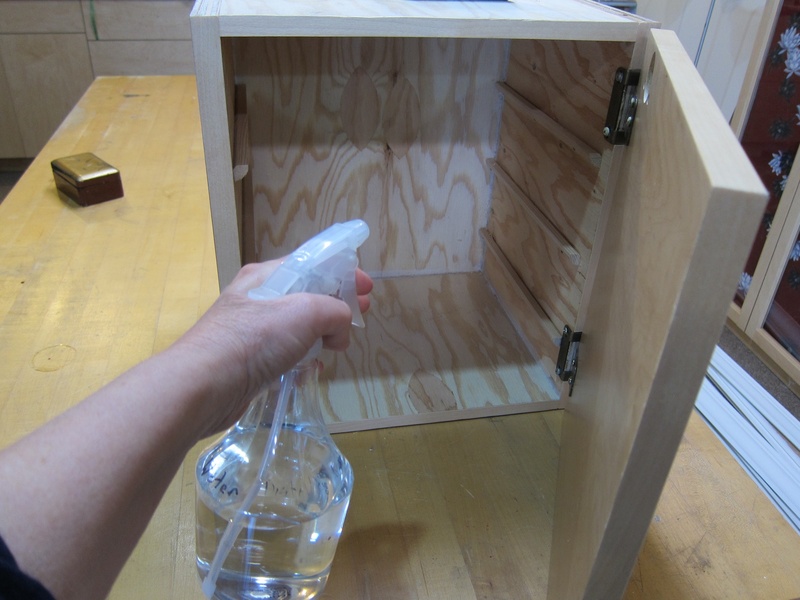 Measurements show that immediately after spraying, the relative humidity in the cabinet is about 99%, but if the door is left open for an hour it will drop to 85%. Over 24 hours the RH drops slowly to about 75%. The relative humidity remains above 70% for about two days. At this time of year the humidity in the lab is about 65%. This is ideal for my purposes. 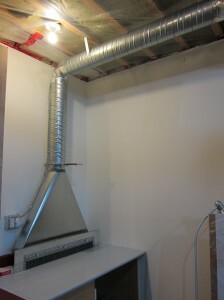 The drying cabinets were installed above ventilation unit for convenient access. The next instalment will outline the project and describe the preparation of the substrate.